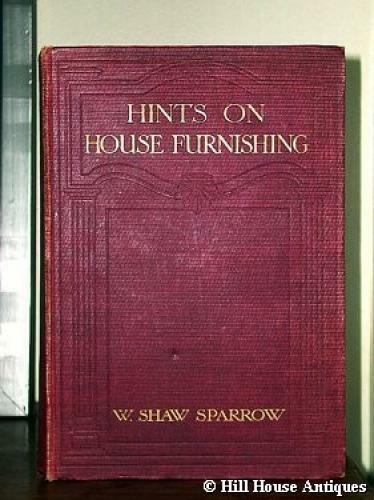 Very useful reference book, Hints on House Furnishing by William Shaw Sparrow. Published by Eveleigh Nash, Fawside House, London 1909. 6.25" by 9" Tall. Bound in burgundy cloth, with gilt titles on front and spine. Approx 307 Pages including index and approx 82 illustrations. 8 pages showing examples of garden furniture. Features designs by William Morris, Liberty & Co., Heal & Son, E.L. Lutyens, C.F.A. Voysey, M.H. Baillie Scott, Walter Cave, Doulton & Co., to name a few. In good condition. Mild wear to extremities of covers. Front hinge is cracked, spine a bit loose. Ex-libris name plate on front paste-down. Small sticker with number taped to top right corner of front-free endpaper. Text pages show moderate to heavy foxing. All pages still intact and securely bound.